The PortableApps.com Installer is an easy-to-use NSIS-based tool for packaging your portable apps. If you develop portable apps then you could of course simply make them available as raw executables, or archives. But that's not exactly the friendliest approach, as you're leaving the end user with the hassle of extracting the contents, deciding where they should go and so on. Which is why the PortableApps.com Installer may be preferable. The program requires that you configure your application according to the PortableApps.com Format, so you'll need to do that first. It's not difficult, and essentially just provides a set of rules governing folder structures (although there's an INI file which defines your program configuration, too). Read more about this on the PortableApps.com site. Once your applications are configured according to those rules, though, it's all very simple. Just point the Installer at your application folder and it'll package it into a straightforward executable, with a quality NSIS core, good compression rates, and multilingual interface (there's support for 71 languages). Please note, though, the program is only licensed for use with free open source and freeware. If you intend to use the Installer for commercial tools then you'll need to contact PortableApps.com, first. 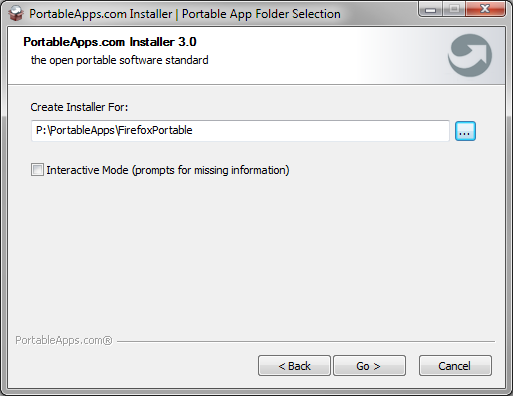 The PortableApps.com Installer provides a quick and easy way to package your portable applications.